The complexities and contradictions of Iranian society resemble a reversible and endlessly shifting facade: everything is both legal and illegal, easy and complicated, sour and sweet. These changing parameters are clearly revealed when looking at the case of Tehran's young artists and their struggle for freedom against censorship, for information in place of isolation and for energy instead of inaction. Despite these difficult conditions, the young generation demonstrates a striking creativity and an enthusiastic desire for knowledge and exchange. In a city where 70% of the population is under 30 years old, the voice of the young generation is strong enough to have a consequential effect, but only in the long-term. Some of these younger artists are producing remarkable works without the possibility of showing them to a large audience, thus preventing the exploration of their potential on a wider scale. Among them, Roxanna Daryadanesh, Shahab Fotouhi and Neda Razavipour, Barbad Golshiri and Vahid Hakim provide an impressive overview of the Tehran art scene's current quality and dynamism. Through their work, these five artists display an energetic use of art as a tool for the demonstration of mental and physical constructions. Iran’s millenary cultural heritage and unique recent political history demand a specific approach based on an analysis of the current context and conditions. Tehran, the country's political, economical and cultural center, is currently running a gigantic architectural promotion scheme. With its 14 million inhabitants and its amplitude of 1,500 sq km, this megalopolis suffers from many common urban problems, such as severe pollution. This is mainly caused by the perpetual traffic jams on the highways that cross the capital. The city itself provides a very challenging context and has given birth to a fascinating branch of 'soft guerrillas' that invert the traditional rules and codes: the impossible becomes possible through the use of subtle camouflaging and language with double-meanings. Artists and art institutions also evolve along this thin line that provides a space for creativity in between government policies. They are engaged in a long-term fight for the development of experimental spaces amidst conservative agendas. However, some stable platforms have encouragingly been set up over the last five years to assist the young generation and to support its initiatives. Things seem to be evolving in a positive and optimistic way, marking the time for a specific look at the current developments in this 2000-year-old civilization. In this context the international community's cooperation remains the only positive side of the drama that occurred with the December 2003 earthquake in Bam. 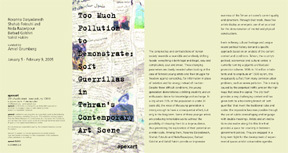 The multidisciplinary artists Shahab Fotouhi and Neda Razavipour alternate between individual and collaborative projects. They recently worked together on an ambitious public art initiative. After obtaining an exceptional permit, they installed 70 neon light boxes in the windows of a 30 meter high building which was under construction. In this way they offered the inhabitants a poetic oasis in the middle of the usual landscape of concrete and cranes. Roxanna Daryadanesh first left Iran after the revolution, at the age of ten, to live in the United States with her family. She moved back to Tehran in 1998 to pursue her career as a performance artist. The rigidity and strict observation of laws concerning the use of images of women and their bodies directly affect female performance artists. Daryadanesh is navigating in a field constantly under surveillance and often has to deal with the police at the opening of her shows. Barbad Golshiri's series of videos, installations, and photography expresses a remarkable balance between foreign art influences and Iranian resonances. Largely based on autobiographical experiences, his work echoes a general desire for change, but a change that excludes the possibility of losing any of the Iranian cultural heritage and way of life. Although the past has not been forgotten by the young generation, they refuse to accept the new rules established after the revolution. In his videopiece What has befallen us, Barbad?, Golshiri transforms the obligation to cut his long hair before joining the army into a creative and intense moment. When used in neon-boxes, the video stills appear as arabesques, resembling calligraphy. The paintings of Vahid Hakim silently express his pensive unrest. The precision and concentration developed in his work reveal a personal quest to create mental islands of freedom in a restrained and isolating context. Their contemplative attraction encourages introspection and breathes fresh air into one’s imagination. Their abstract power resides in a subtle combination of geometric patterns inspired by Persian carpets and a perfect mix of acrylic and vegetable colors.